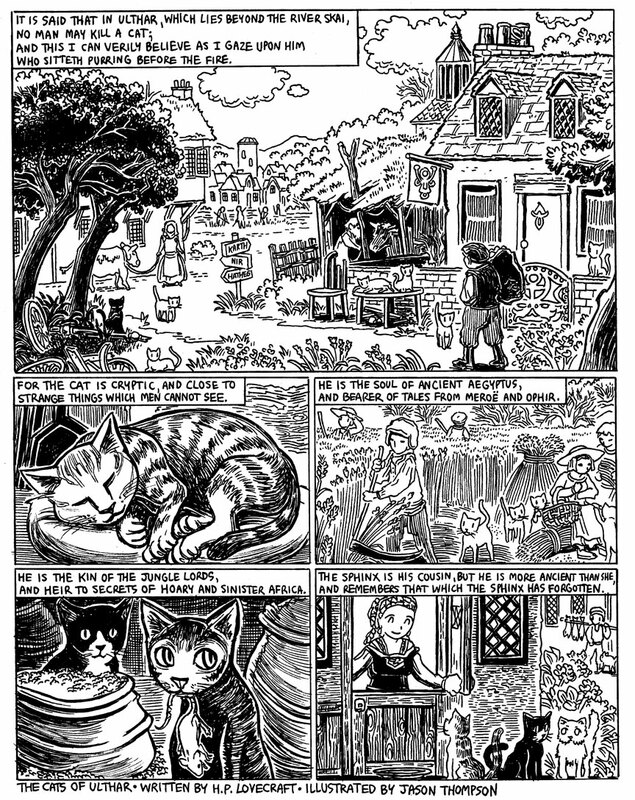 In form and content this is a very Dunsanian tale, although Lord Dunsany would never have written a story about cats: that dude was such a dog person. (Dean Spanley isn’t an anomaly.) There’s a photo of him in his biography of him sitting with a huge hunting dog sprawled right across his lap. Meanwhile, Lovecraft was content to observe the neighborhood cats from afar… although he, too, would pet them and occasionally let them jump in his lap if the mood struck them. Considering that a frustrated Sonia Greene apparently once told Lovecraft “I do believe you’d take a cat to bed with you if you could!”, I can’t believe there’s no catgirl character in Haiyore! Nyaruko-san. If you’re in Seattle this weekend come on by to Emerald City Comic-Con where I’m tabling! I’ll be bringing some original art and some new projects and I’m looking forward to the show!! I’m in Artist Alley table X-11, way in the back of the convention center (map behind link). Please come check out both panels and say hello at the booth if you can! Whether your tastes run to Lovecraftiana, the amorphous nature of human sexuality, OR geeky tabletop/card-dealing & drawing games, this weekend, I’m ready to nerd out with you! See you soon! Lovecraft did love the feline over the canine. And it was the cat that would appear in so many of his stories. Ulthar is in the Dreamlands. But I think many of these places were in the prehistory historical times originally then drifted into those orienoscopic realms as time went on and Lovecraft wanted to explore them in (his) modern times. Yet these are real places and we are told there are two means of entering and exiting the Dreamlands in the waking world. One of them is where part of the Zoogs domain overlaps and one other. Wish I could go to the convention. Sounds most interesting to me. hey i’m working on a small theater production of a compilation of lovecraft’s work called the nightmare suite.. which includes the cats of ulthar. i came upon your artwork on google, and i would like permission to use some of it, specifically in animation for projection mapping purposes. I would be happy to credit you in both the program and the credit videos.. and give you a copy of all of the video i create to use in your own projects. i will find out if i can arrange a donation to you though we’re a really small group – I’m writing this on behalf of Molotov theater group, the only gran guinol theater group operating on the east coast as far as i know. Oddly i looked you up and you’re in my hometown, where i’m returning in a few months – i really wish i’d stopped in to your workplace as many times as i’ve passed by it. @Rachelw– Thanks for the comment, that sounds cool! :) Send me an email at my first name @ mockman.com and tell a little more about the stage project, I’d love to know more! !